Yesterday was opening day of the Forest Park Farmers' Market for 2012 and my first day selling produce grown at the Mini Farm. On Thursday night prior to the market, I nearly had a panic attack because I felt unprepared and was very worried I wouldn't have any product for my table. 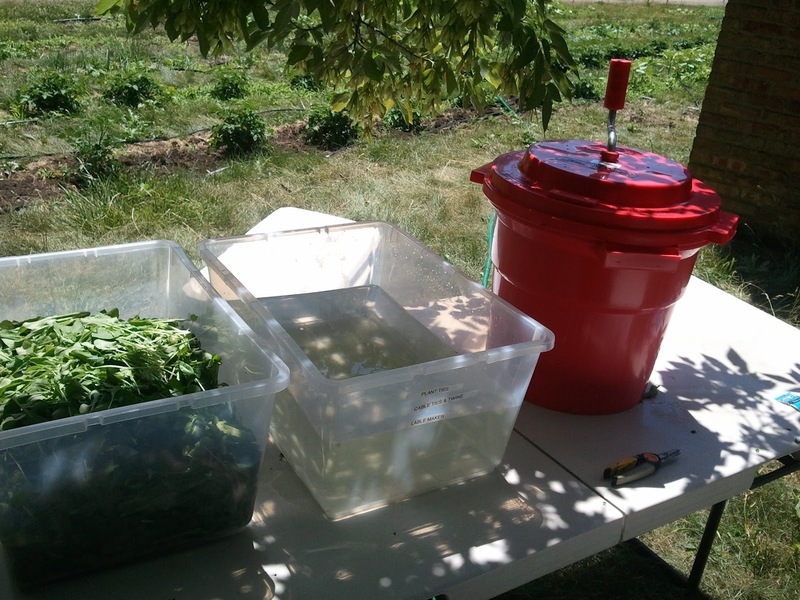 But, once Friday rolled around and I started harvesting crops, I felt MUCH better. I've got to tell you, once I got to the farm and saw just how many things were ready to harvest, I was surprised and delighted. I had a row of beautiful Southern Curled Mustard Greens. I harvested those first, leaving some leaves on the plants to hopefully generate new harvests within a couple weeks. I cut about eight big beautiful bunches. I also was shocked how big my baby arugula plants were. I just seeded these about three weeks ago and they were already big enough to cut as salad greens. 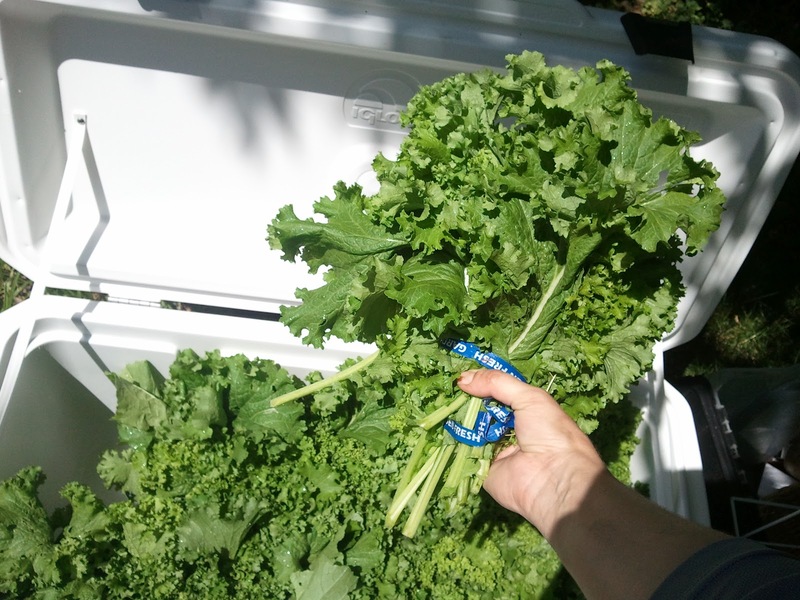 I harvested about 1/4 of the crop which equaled about 4 pounds of greens. I had expected to harvest the mustard and arugula, and once those were washed and packed I began wondering around the farm looking for other stuff I could sell. I found some broccoli heads--not a ton but still more than I expected--as well as a TON of baby broccoli raab greens, which are great as salad greens or lightly cooked in a stir fry for instance. I got three pint boxes of broccoli and about 4 pounds of baby raab salad mix. 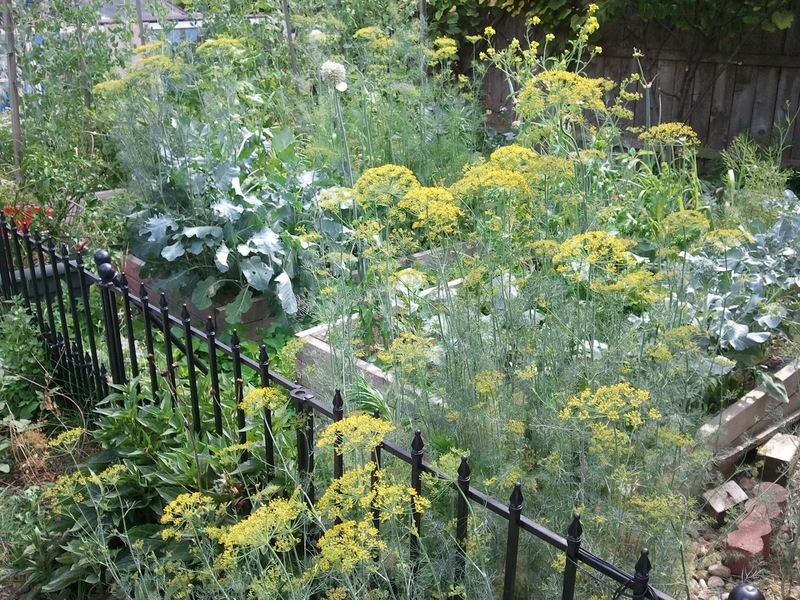 To round out things, I also harvested eight large bunches of dill from my backyard garden. I hoped someone would want to make pickles. I also brought a few small bunches of lemon basil, thai basil, and parsley. Finally, I brought a few pots of rosemary, thyme, and mint, all of which I could cut to order as people requested them. 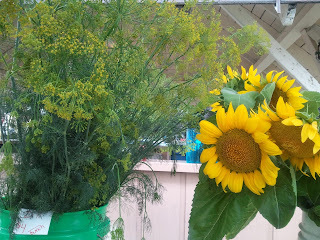 To round off my selection, I brought several large and small sunflowers, also from the backyard, and half a dozen of small assorted pint jar bouquets. So, how did the market go? The simple answer is that it went well. Set-up was easy and I was happy with how my booth looked. I was given a great spot at the entrance to the market (depending on which direction you enter from I suppose) so I was able to greet everyone as they entered. In general, I feel that turnout was decent, although not as busy as some other more well known markets in the area. That's all I can remember right now, sorry if I left anyone out! Anyway, other reasons to come to the market include: a bouncy castle for the kids, live folk music (created a great ambiance at the market this year), and not-your-status-quo grill food prepared at the Market Grill by Chef Denise Murray using many ingredients from the vendors themselves. I very memorable experience from last year's market for me was eating Denise's pumpkin bisque which I remember had dollips of goat cheese in it and was simply to die for! Proceeds from the Market Grill go to help fund the Forest Park Food Pantry, which is great! 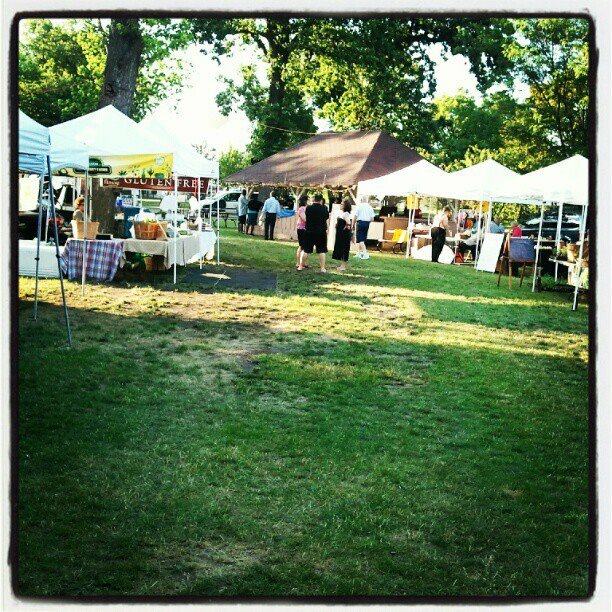 This year's Forest Park Farmers' Market is only missing one thing: You! The market needs customers, y'all. 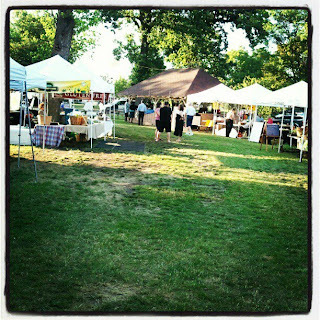 This is the third year of this iteration of the farmers' market and the past two years have been a bit of a struggle. A market without customers will lose its vendors and will be a tougher sell to the sponsoring agency--in this case, the Village of Forest Park--when its time to decide whether to continue the market year after year. I want to see this market succeed, and not just because I am a vendor and want you to buy my stuff. Forest Park has put a lot of effort and resources into building a strong market and now all the market needs is for the community to support it by spending time at the market and buying products there. While the turnout at yesterday's market was better than this one photo I took would suggest, I can report that my sales at my booth were not as good as I had hoped. In general, I sold only about 1/4 to 1/3rd of the product I had brought to market. 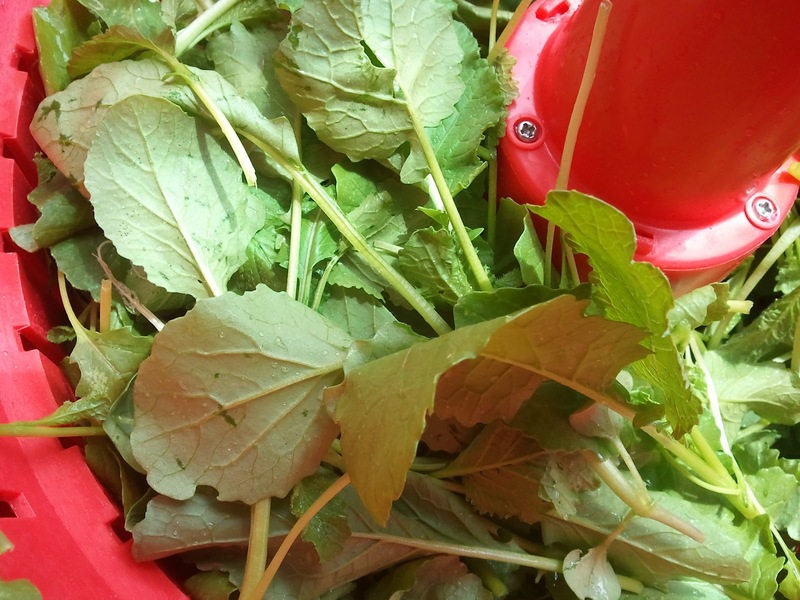 For instance, those big beautiful mustard greens? I only sold one or two bunches of them. I gave what was left over to the food pantry and also brought a couple home to eat myself, so the leftovers didn't go in the trash at least. No one went for the dill, which is all now at home in my fridge (I better find a good pickle recipe and fast!) 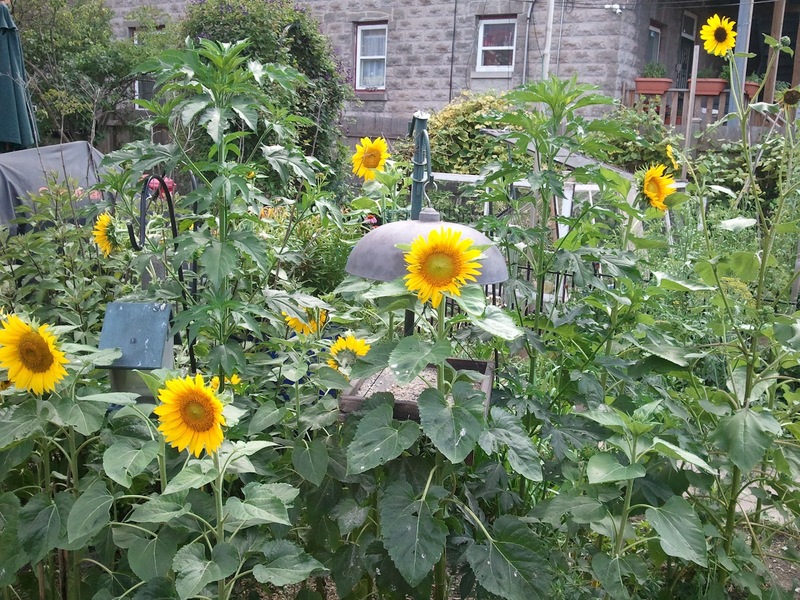 and I almost thought that no one would buy any of the sunflowers, which I thought were beautiful (I did eventually sell about half of those). Arugula was by far my most popular product, and I sold about 2/3rds of what I brought. But not very many people went for the baby raab salad. I gave some of that to the food pantry too and also brought some home for me. I want to offer products that people are interested in buying and I know some items I offer are a bit obscure or unfamiliar. I promise I'll have tons of tomatoes, squash, basil, and eggplants in about a month, but until then please consider giving the items I do have a try. Also, I am always greatful to receive your feedback regarding my products (selection, quality, etc) and my prices. If you ever have a question or a comment or suggestion, don't hesitate to let me know! So, for those of you who were able to make it to yesterday's market, I hope you had a great time, find some great products, and I hope you plan to return frequently. If you weren't able to make it to the market, I hope you'll find time to come visit sometime soon. Everyone, please tell your friends and family about the market and encourage them to give it a try. Since we have the Market Grill and the wonderful picnic tables and natural setting at the grove, its a great place to bring the family or friends for an after work get together. Have some food, take a load off and enjoy the shade trees. Don't forget, when you are shopping at the market, don't be afraid to try new foods or products you may not be familiar with. If you see something that you are not familiar with or you don't know how to use it, just ask the vendor. By nature of the business, we are all experts on our products and are EXCITED to tell you about them and suggest ways to incorporate them into your food and life. There are so many unique foods out there, imagine all the potentially awesome meals you'll never have unless you try them! Thank you so much for visiting my blog and reading this epic post. I am usually not this long-winded. 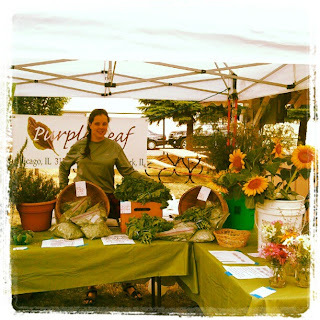 Hope to see you at the market soon! 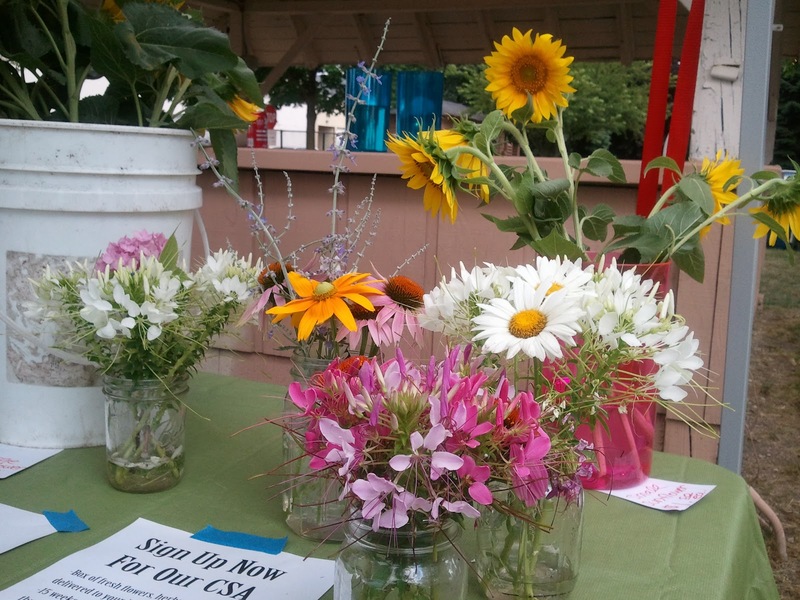 PS: I still have a few CSA shares left, click the CSA tab for further details. Thank you!